This projection is particular useful for evaluation pathology involving the entire ankle mortise and the proximal fifth metatasals, a common fracture site. Place leas shield over pelvic area. Take radiograph with patient in the supine position; place pillow under head; legs should be fully extended. Center and align ankle joint to CR and to long axis of portion of IR being exposed. Do not dorsiflex foot, but allow to remain in natural extended (plantar flexed) position (allows for visualization of base of fifth metatasal - a common fracture site). Internally rotate entire leg and foot about 15 to 20 degrees until intermalleolar line is parallel to IR. Place support against foot if needed to prevent motion. Collimate to lateral skin margins, including proximal matatasals and distal tibia-fibula. Close collimation and lead masking are important over unused portions of image plate. Notes: This position should not be a substitute for either the AP projection or the oblique ankle position but rather be a separate projection of the ankle that is taken routinely when potential trauma or sprains of the ankle joint are involved. 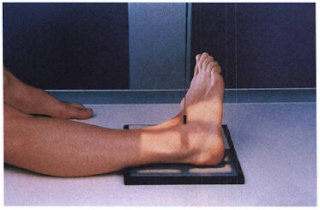 This is also a common projection taken during open reduction surgery of the ankle. Distal one-third of the tibia and fibula, the tibia platfond involving the epiphysis if present, the lateral and medial malleoli, the talus, and the proximal half of the metatasals should be demonstrated. The entire ankle mortise should be open and well visualized ( 3 to 4 mm space over entire talar surface is normal; an extra 2 mm widening is abnormal). Proper obliquity for the mortise joint is evidenced by demonstration of open lateral and medial mortise joints with the malleoli demonstrated in profile. 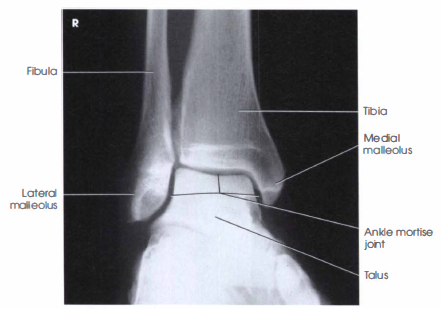 Only minimal superimposition should exist at the distal tibiofibular joint. The center of four-sided collimation (CR) should be to mid-ankle joint with the distal one-third of the lower leg to the proximal half of the metatasals included. All soft tissue structures also should be demonstrated. No motion as demonstrated by sharp bony outlines and trabecular markings. Optimal exposure should demonstrate soft tissue structure and sufficient density for talus and distal tibia and fibula.